Girls stylish pale pink swimsuit by Lili Gaufrette. Made from soft and stretchy lycra, with a shiny gold print, and a cut out back. It comes with a waterproof zipped pouch. 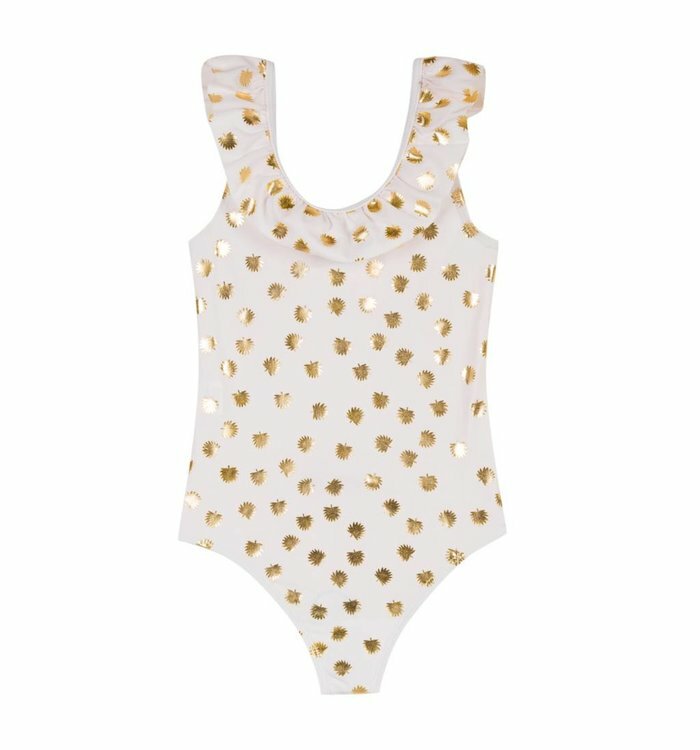 Girls stylish pale pink and shimmery gold swimsuit by Lili Gaufrette. 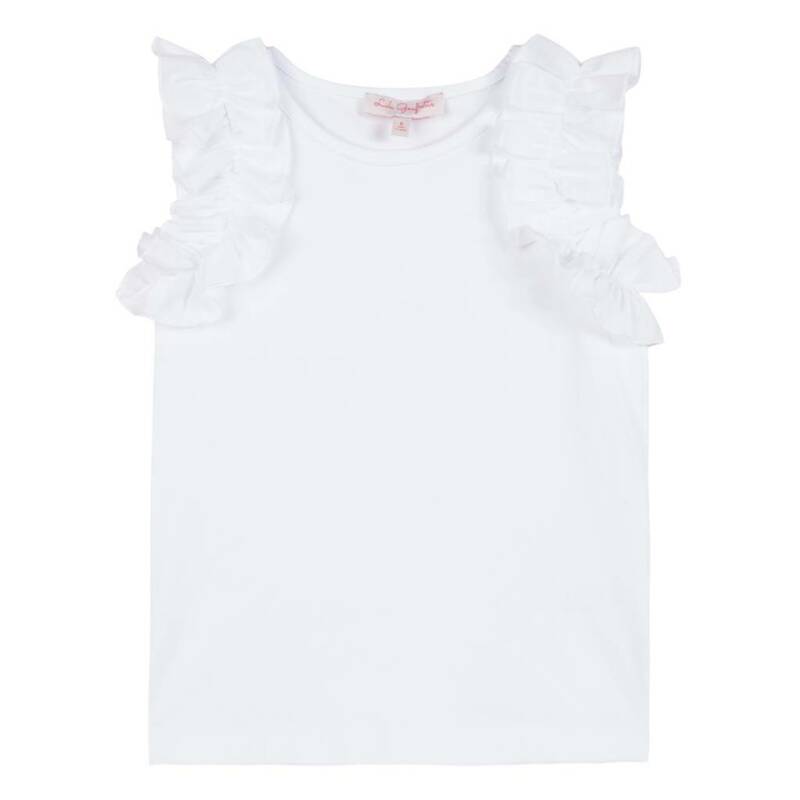 Made from soft and stretchy lycra, with frilled straps. Comes with a waterproof zipped pouch. 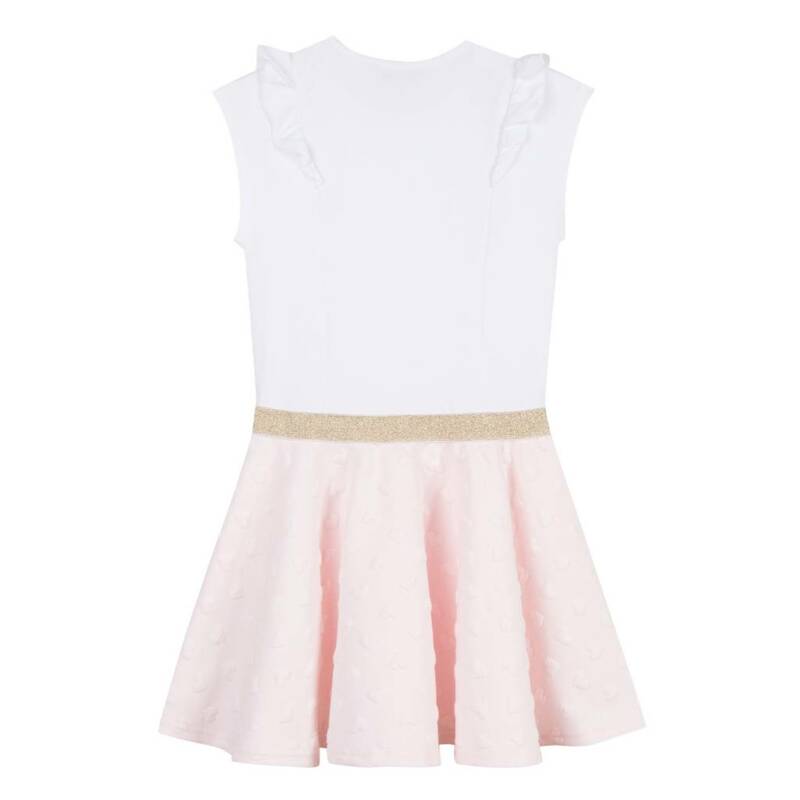 A pretty gold and white dress for girls by Lili Gaufrette. 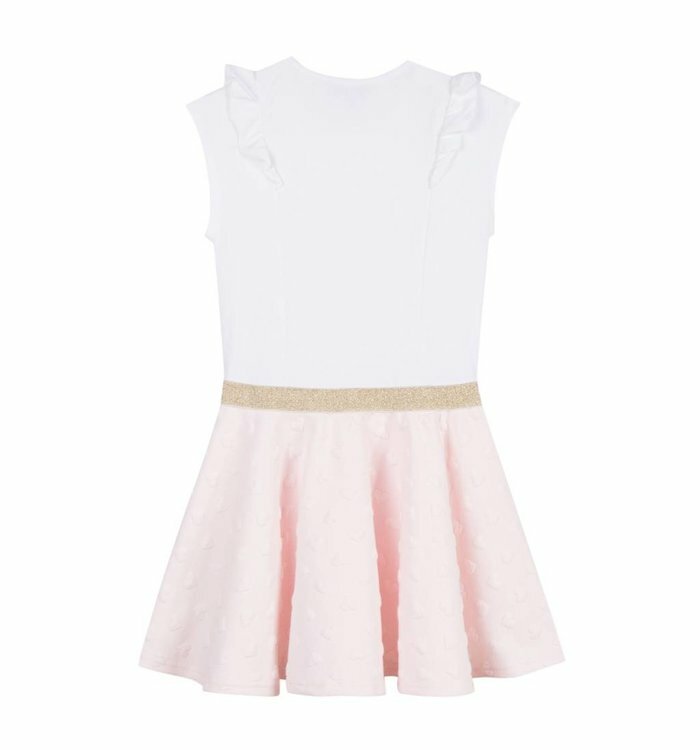 It has the appearance of two-piece in one, with a comfortable white cotton jersey top, ruffles around the sleeves, and a sparkly gold pleated skirt. 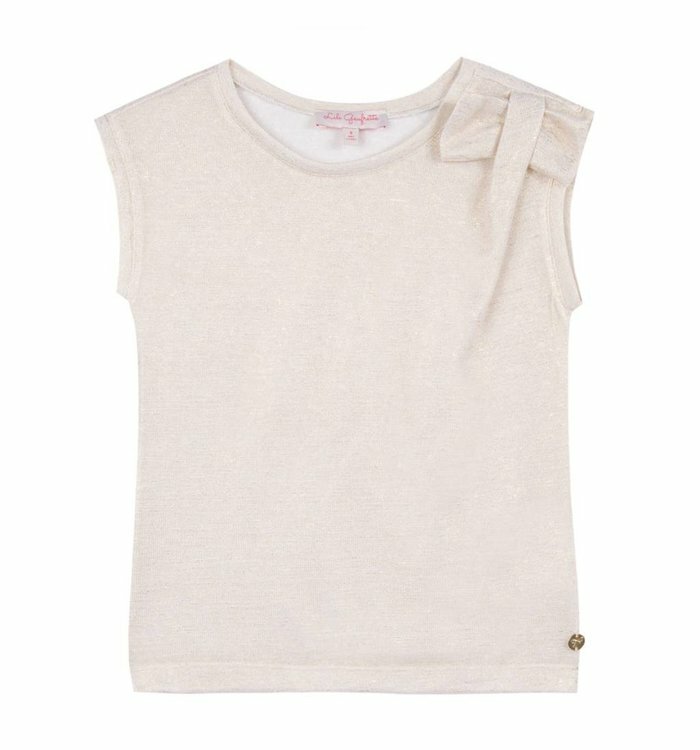 It has a soft, lightweight cotton lining. 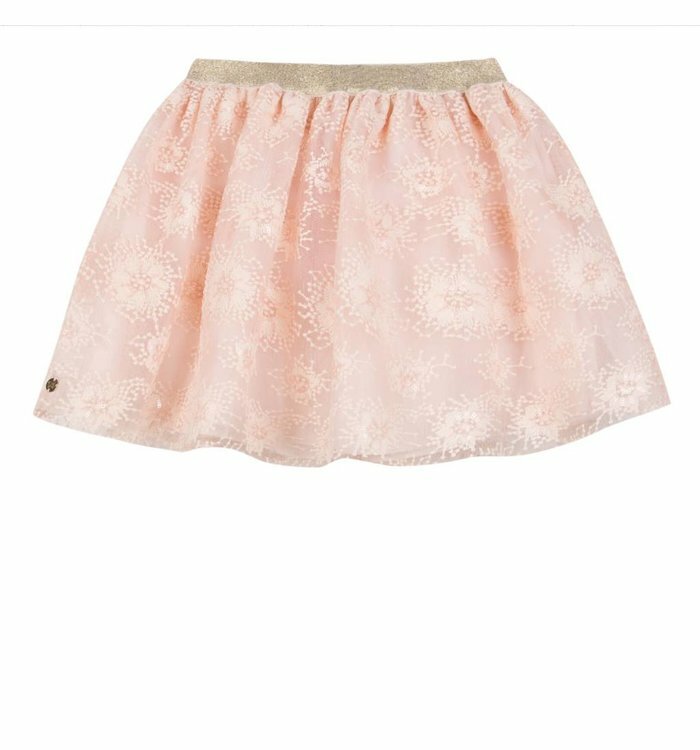 Girls lovely pink skirt from Lili Gaufrette, made in soft embroidered tulle with sparkling sequins. 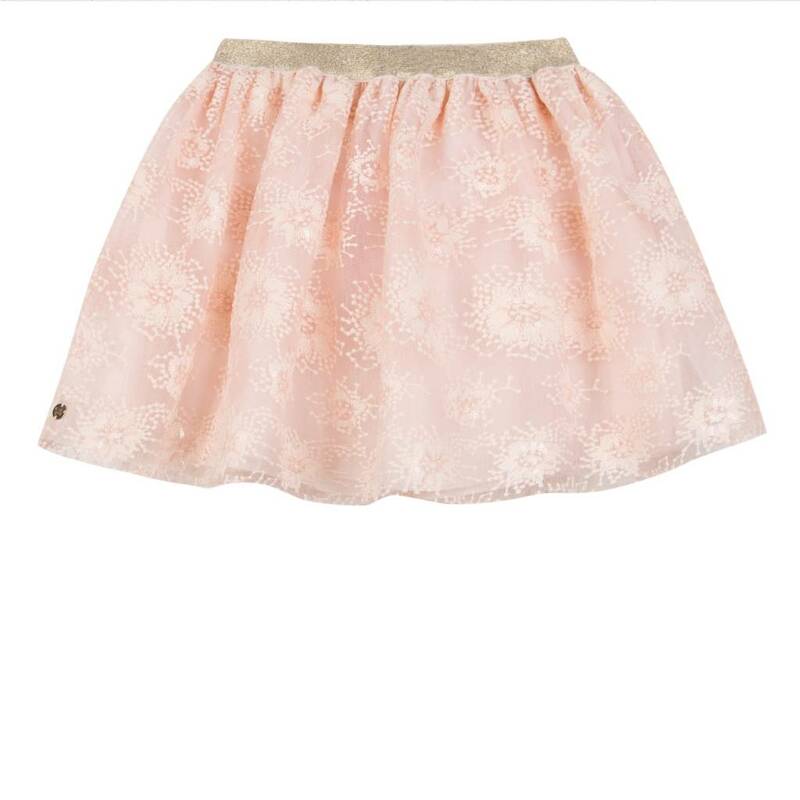 Full and gathered, it has a glittery gold, elasticated waistband and a lightweight cotton lining. 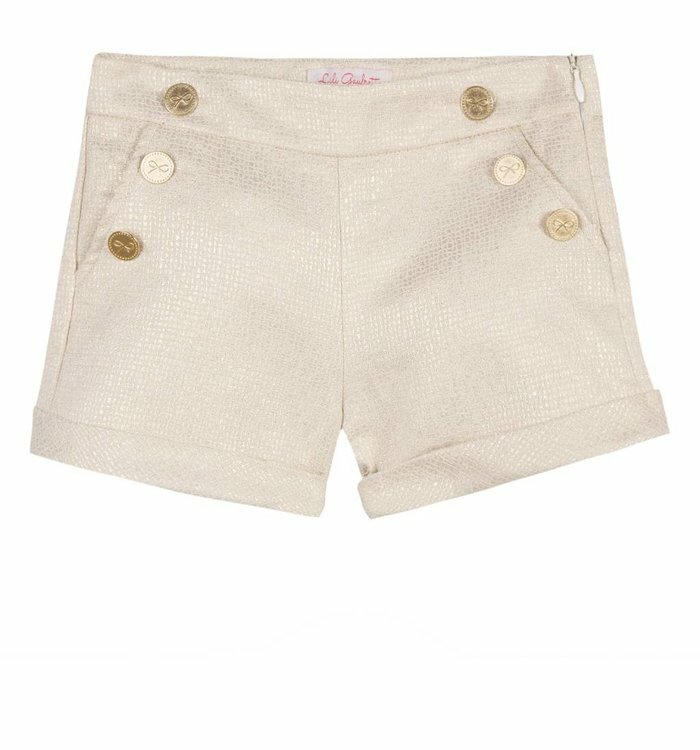 Girls smart gold shorts by Lili Gaufrette, made with a sparkly gold thread in the fabric. They have shiny, gold logo buttons on the front, and fasten with a side zip. The waistband is adjustable for a comfortable fit. 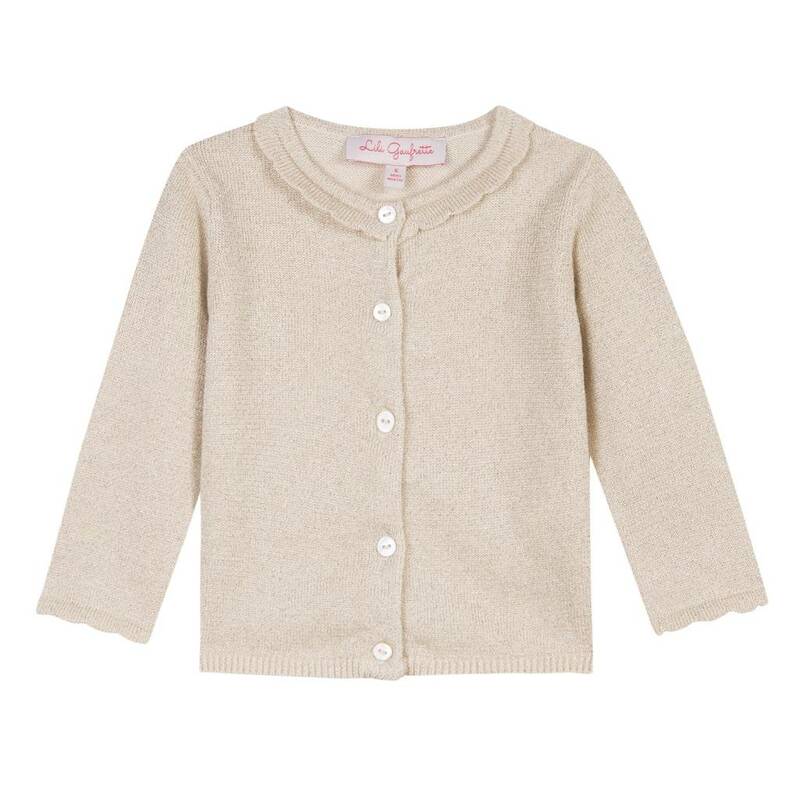 Girls Lili Gaufrette cropped cardigan in white with one button closure at the neck and embroidered bow detail on the chest. 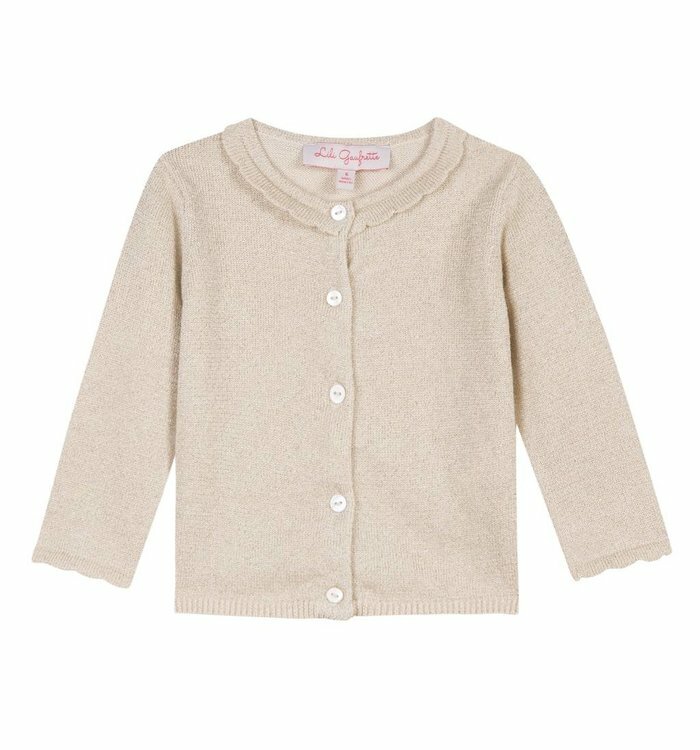 Made in super soft and lightweight knitted viscose, this pretty Lili Gaufrette cardigan has frills on the shoulders and sparkling thread in the weave. A simple vest top with a girly twist. 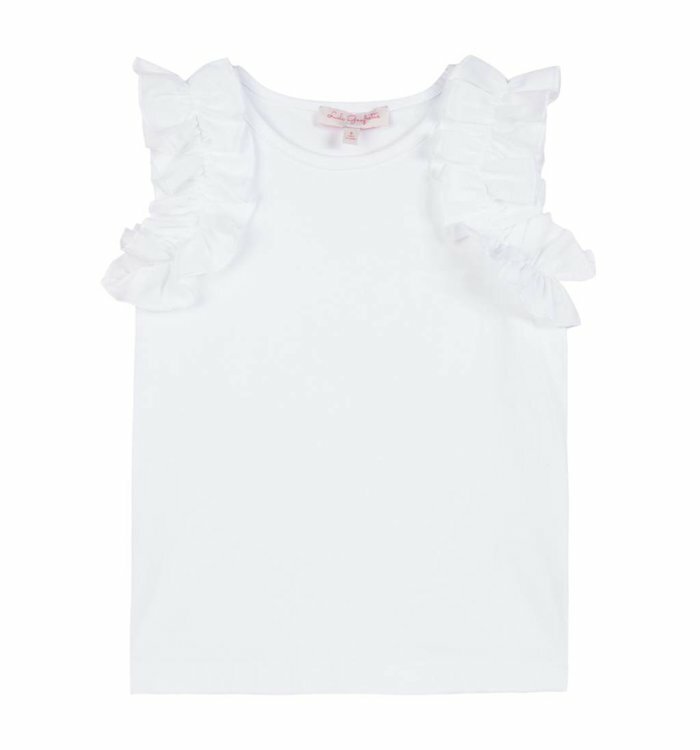 This Lili Gaufrette vest top has a frilled detail. 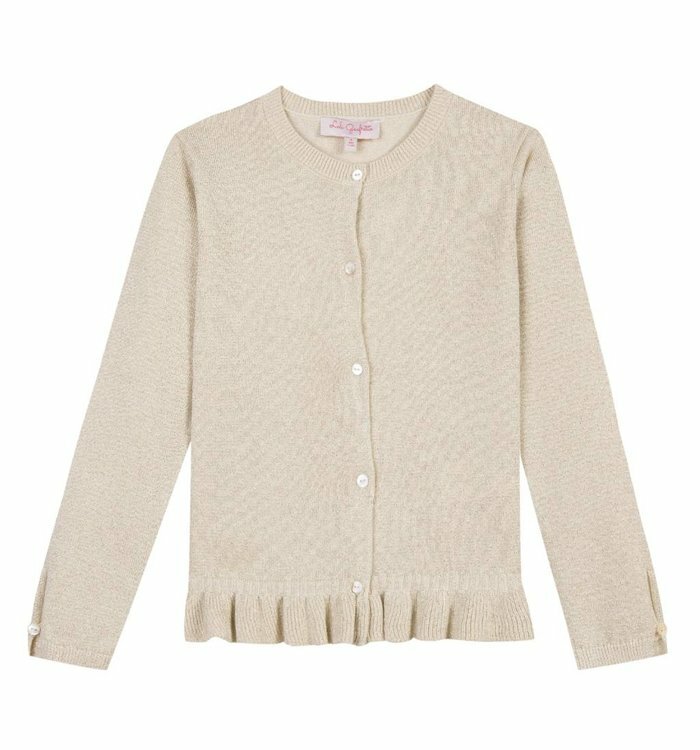 A simple but classic in her spring wardrobe. 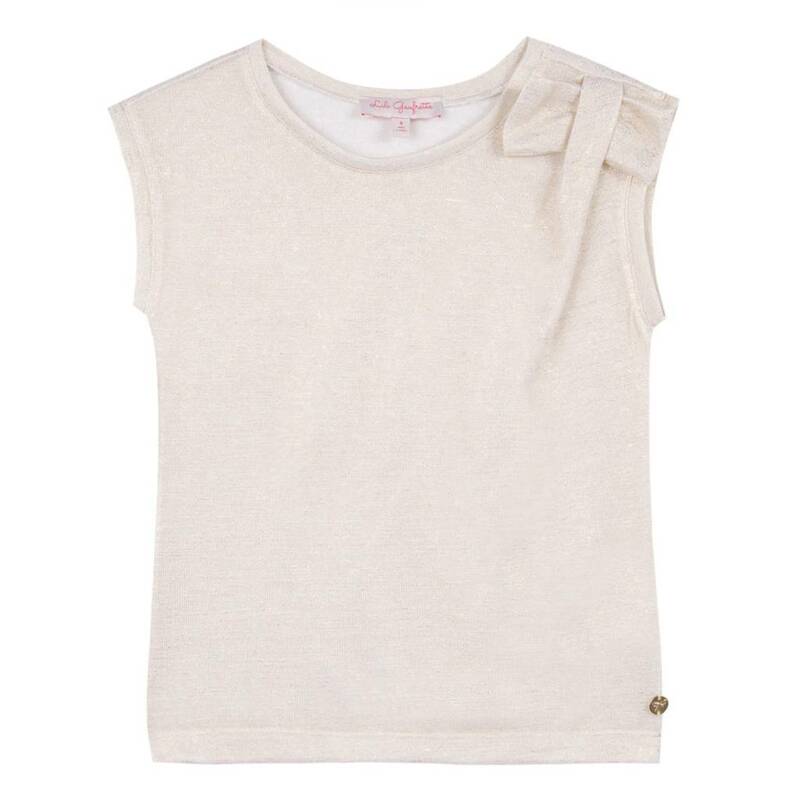 Glistening with golden thread, this viscose top has a pretty bow on one shoulder. Lined in jersey on the front, the back is slightly see-through.